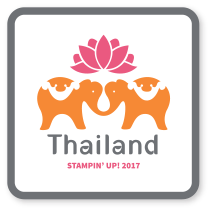 I recommend visiting their blog and checking out what other stampers came up with. Some of them are absolutely beautiful! Here's my version of this week's challenge. This card is made using the Cycle Celebration stamp set (one of my favorites from this year's catalog) and the matching Designer Series Paper. One of the things I absolutely LOVE about Stampin' Up! is that everything coordinates. This stamp set has an entire line of coordinating products. Have you ever spend hours in the store trying to match paper to ribbon? With Stampin' Up! you will never have to do that. They've done all the work for you! I also used one of my favorite colors, Bermuda Bay. I've caught myself using this color a lot lately! It's just so bright and fun!